Home › Latest News › ​Blood, Sweat & Gears! On Friday 3rd March 2017, we hosted Blood, Sweat & Gears, an event where we invited different teams to build/ rent their own go-karts and race them around a track in front of our dealership. The team with the most laps in an hour would win. We upped the stakes toward the end of the race, offering 10 bonus points to the team that made it around the track backwards in the fastest time. 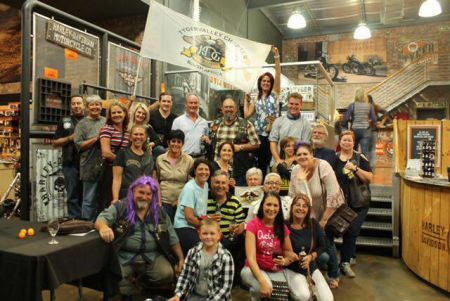 Well done to H.O.G.®® Tyger Valley Chapter for winning the trophy! bystanders as well! Monster Energy Drink kindly supplied a pit-stop with ice-cold Monsters for anyone that needed the fuel. Customers were also treated to a show of a different kind in the form of fire breathing, eating and dancing by Ashleigh Caddick from Spotlight Entertainment. We couldn’t keep our eyes off her, especially when she danced with lights that formed the Harley-Davidson® Bar & Shield logo! Young and old came together for a night of team work, great entertainment and prizes! Thank you to the BEAR Rally for sponsoring two tickets as spot prizes, as well as to the Tyger Tavern for their beer, brandy and meal vouchers that we were able to spoil the crowd with. Tailgate Foods ensured that no-one left hungry, while The Boston Boardroom had some of the best coffee around on offer!